Dank, grey, impenetrable. Never mind the weather. This was my mood today after the Champion Chase. A pall of low cloud hanging over Prestbury Park was obscuring Cleeve Hill and cloaking everything in cold mist. Cue clunky similie…. ! We were only two today. Dad’s leg is playing up and he’s decided against putting it through the rigours of another circuit of the racecouse. He’s sportingly driven me and Bruv over here through fog and rain, and will return to watch the action back at our Stow nerve centre. Approaching the track from the town centre is a very different experience to the walk through car parks from the north yesterday. Then we wove through endless Range Rovers tail-gate picnics of champers and smoked salmon, hosted by country couples wearing enough acreage of tweed and corduroy to carpet the home straight. Today, we dodge groups of lairy pint-pot screamers, fancy-dress debs and busking children (I kid you not). 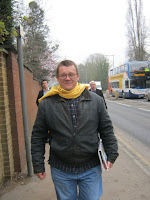 Bruv was unable to resist accepting a lovely yellow Betfair scarf handed out from a box in someone’s front garden! The crowds seem thinner today. Yesterday was as busy as I can remember in the Best Mate enclosure, confirmed by the Racing Post which put the total attendance at over 53,000. Much more elbow room today though. We watch the first from the rail by the winning post. I take a photo for a couple at their first festival. She looks at the image on the back of the camera and exclaims “Oh, that’s not a very good one!” Her partner retorts, ‘Well why didn’t you smile then you daft tart!”I hand the camera back and beat a hasty retreat. I’d hate to be the cause of a domestic. The early races are nothing short of carnage on the punting front and at least two are unsatisfactory on the racing front, too. The four-miler sees a convincing win for Chicago Grey, produced expertly by his amateur rider. 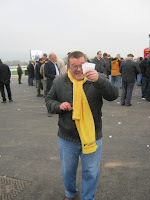 Bruv collects a little, but is also getting excited about a horse we’ve both backed, Pearlysteps. Only he’s cheering on the wrong horse! Wrong colours, wrong jockey! The Neptune Hurdle is one of my favourite races and one I’ve had a good degree of success in. Today, Rock On Ruby gets mugged right on the line by First Lieutenant. In truth, ROR might have been scrapping for 3rd had not Oscars Well and So Young both smashed through the last, stopping their momentum as sure as slamming the gear stick into reverse. My nap of the meeting, Wymott was up next in the RSA Chase. What a shambles. He was never travelling. Not interested. Spat out the dummy. He wasn’t alone. 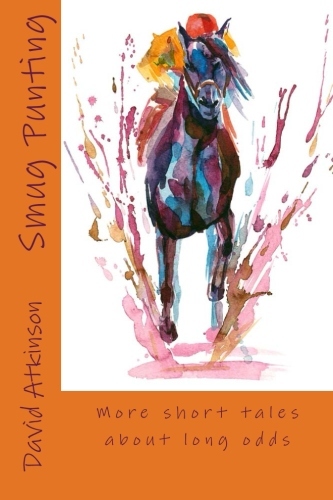 Red hot favourite Time For Rupert was lethargic and sluggish at his fences. And two horses fell when tanking along. This left Jessies Dream and Boston’s Angel to fight out the finish, with the latter prevailing under a gutsy, gritty and determined drive. Despite a shocking show from my team, I’m pleased for trainer Jessie Harrington who is a talented, self-effacing and engaging individual and who saw her charge, Oscars Well fluff his lines just now with the race at his mercy. Champion Chase. Best spectacle of the meeting for me. Elite chasers fencing with accuracy and speed. But not any of the rags I backed. Sizing Europe wins well. French Opera is not up to this class. How could I ever think he was? What do I know? An ill-advised exacta perm is also a grubby little cash-grab. I’m starting to lose reason, judgement and balance. And that’s not just a result of the emptied hip flask. Bruv is having an equally bad time. Reflecting back on the first, he says, “Comes to something when the highlight of your day is cheering home an each way shout. 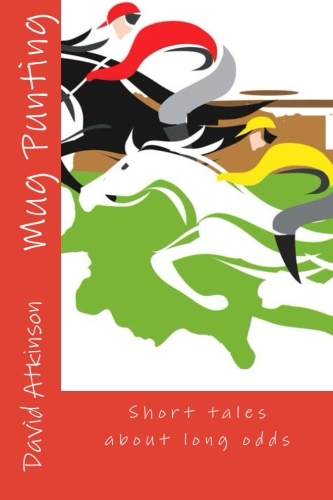 And it’s the wrong horse!” Even through my dark mood, I raise a grin. He goes on. “You know you’re having a bad day when your get-out stakes is the Coral Cup!” I thought I’d cornered the pathos market. Ah, the Coral Cup. 2 ½ miles and 27 unfeasibly handicapped runners. BUT NOT TODAY! Through very different reasoning and obscure circumstance we have both backed Gordon Elliot’s Carlitto Brigante in this minefield of a race. And he bolts home! We were celebrating long before the last hurdle fall of his nearest rival made the run-in academic. 20-1. That sounds lovely. Much high-fiving and back-slapping was set loose. We warmly applauded the horse home. 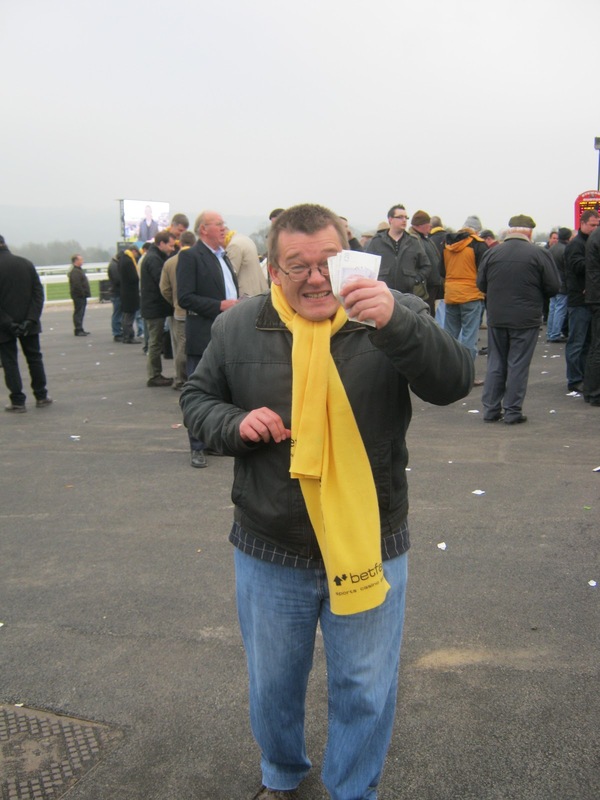 (Just once, I’d like a winning jockey to doff his cap to the Best Mate enclosure. A small gripe, admittedly...)”. Paul collected his wedge there and then and I had that particular little thrill later in the Ladbrokes in town where I’d struck the bet. I love race horses. These animals are beautiful athletes, trained to perfection, running and jumping with fluidity, grace and verve. But sometimes that poetry takes second place to an outpouring of baseless, charmless, shameless and ugly greed. Filthy lucre. That changed the day, of course. We prowled around the bookies having little ‘fun’ bets on the remaining two races and generally feeling pretty pleased with ourselves. Infact, nothing else went our way, but that didn’t matter. We met Dad down the town. Back at the ranch, we wound down over a few beers and a medium rump steak with all the trimmings. We’re ducking out of the live action tomorrow and heading back home. But the action merely cranks up and moves venues. Bacchy’s Fantasy Festival Competition is hitting top gear. A good few of the lads have entered this inspired and original competition based on fantasy wedge to punt on four festival races per day. The e-mail banter has been electric and plenty of scores have been notched. Winner takes all come the heady, charged denouement in a Westminster boozer on Friday afternoon.